Editor’s Note: Visit The Lancet to read the full paper. Given the continued significant impact of obesity on both public health and health care spending, a more effective way to tackle the epidemic is needed, according to a paper published today in the Lancet co-authored by Brookings Center on Social Dynamics and Policy Director and Senior Fellow Ross Hammond. A “systems approach” offers particular promise, by considering multiple ways in which food policies can affect the food, information, and social environments that underpin dietary intake and by developing a set of reinforcing policy actions to target these pathways, write Hammond and his co-authors. Click image for full size and visit the Lancet for more research on obesity prevention. Policies can work to facilitate learning of healthy preferences and habits, in school and other early-life settings, through repeated exposure and social influence by parents, peers, and role models. This is particularly important because unhealthy preferences and habits can be difficult to unlearn. School settings can facilitate exposure to more fruits and vegetables while restricting exposure to less healthy options through food standards. Policies can help to remove barriers to expressing healthy preferences. These barriers can include food prices or other issues that make good dietary choices inaccessible to some groups, and a lack of available nutrition information about choices. Policies can encourage or “nudge” reassessment of unhealthy preferences by affecting the way in which food is presented and priced through subsidies, taxes, and altered retail or advertising environments. Policies can stimulate actions across the broader food system, from farming to processing to distribution. The food system is complex and multi-layered, but forms the context for all dietary choices and is an important focus for policy. A recent National Academy of Sciences report to which Hammond also contributed provides a framework for understanding the impact of food system policy choices. Rather than approaching any specific policy as a “magic bullet,” the authors of the Lancet paper advocate a combination of actions that are mutually reinforcing, that are designed to target several of these specific pathways at once, and that cross multiple policy domains and contexts. They lay out specific steps for the design of smarter policies, emphasizing the importance of transdisciplinary engagement between public health, behavioral science, and complex systems science as well as “systems oriented” assessment of how policies work. The paper also lays out the central role that computational modeling can play in assisting decision-makers, both in identifying key mechanisms at work and in designing policies to effectively target these mechanisms. Hammond’s past research found that obesity accounts for fully 21 percent of all U.S. medical expenditures, translating to $215 billion annually in overall economic impacts, and continues to be a major health problem, with more than two-thirds of Americans now overweight and rapid recent increases among children. Although some progress has been made, the new Lancet paper argues that “smarter” food policies are needed, grounded in a systems approach, in order to make faster progress in addressing the global obesity epidemic. Prevention of obesity requires policies that work. In this Series paper, we propose a new way to understand how food policies could be made to work more effectively for obesity prevention. Our approach draws on evidence from a range of disciplines (psychology, economics, and public health nutrition) to develop a theory of change to understand how food policies work. We focus on one of the key determinants of obesity: diet. The evidence we review suggests that the interaction between human food preferences and the environment in which those preferences are learned, expressed, and reassessed has a central role. We identify four mechanisms through which food policies can affect diet: providing an enabling environment for learning of healthy preferences, overcoming barriers to the expression of healthy preferences, encouraging people to reassess existing unhealthy preferences at the point-of-purchase, and stimulating a food-systems response. 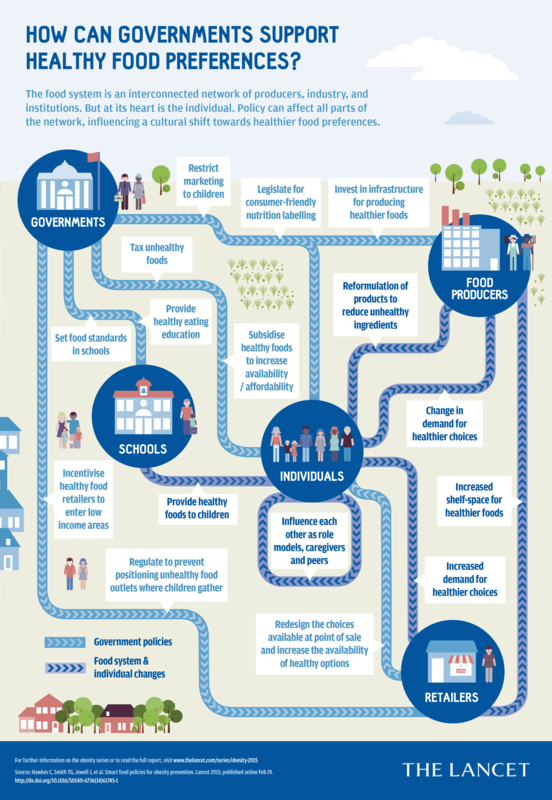 We explore how actions in three specific policy areas (school settings, economic instruments, and nutrition labeling) work through these mechanisms, and draw implications for more effective policy design. We find that effective food-policy actions are those that lead to positive changes to food, social, and information environments and the systems that underpin them. Effective food-policy actions are tailored to the preference, behavioral, socioeconomic, and demographic characteristics of the people they seek to support, are designed to work through the mechanisms through which they have greatest effect, and are implemented as part of a combination of mutually reinforcing actions. Moving forward, priorities should include comprehensive policy actions that create an enabling environment for infants and children to learn healthy food preferences and targeted actions that enable disadvantaged populations to overcome barriers to meeting healthy preferences. Policy assessments should be carefully designed on the basis of a theory of change, using indicators of progress along the various pathways towards the long-term goal of reducing obesity rates.